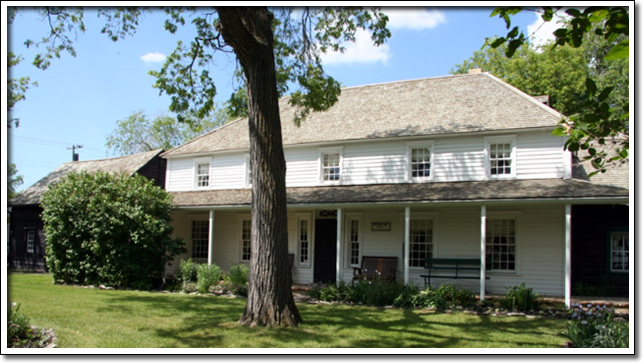 Seven Oaks (1851-1853) is one of the oldest extant houses in Manitoba. The site includes a General Store, which is half of a two-room house from the 1830s - one of the few surviving examples of Red River frame construction; the other half was incorporated into the main house as its kitchen. The house takes its name from a nearby creek where seven large oak trees once stood, marking the site of the Battle of Seven Oaks fought in 1816. It was the home of John Inkster (1799-1874) and his wife Mary (1805-1892), daughter of Hudson’s Bay Company Chief Factor William Sinclair and Nahoway, his Cree wife. John Inkster was a prominent merchant and free trader. From 1857-68 he was a member of the Council of Assiniboia, which oversaw the legal and administrative activities of this first European-origin agricultural colony in western Canada, the Red River Settlement (1812-1870). The house, built with log walls in a stately Georgian style, stands today as a reminder of the period that was defined by Hudson’s Bay Company trade, of the transition from a fur trade to an agricultural economy, and of the increasing dominance of British colonial rule.